You are men and you do not like to go to dentist? 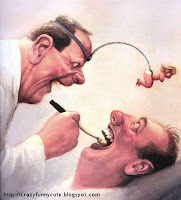 If you are men and you do not like to go to dentist there is funny little trick that will make you say "A, a, a". You do not agree with me? Common, admit, with this tool every average dentist can do what ever he want with your tooth and you will not even notice that. This is perfect solution for your fears.